RosettaBridge, the popular TMS from Unique Digital, now includes full integration with the QSC CMS-2200 Media Server. RosettaBridge TMS is a full featured TMS with an unrivalled suite of tools to manage film, advertising, and trailer content within each site through an intuitive and easy to use interface. “As RosettaBridge TMS gains an increasing foothold in the US and LATAM markets, it is key for us to integrate with installed media servers such as the QSC provided range. 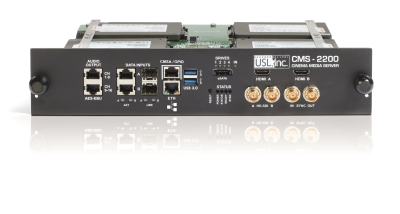 We are delighted to be able to offer the CMS-2200 integration to our US exhibitor partners,” commented Mark Stephen, Director of Sales for Unique Digital. Last March, QSC announced CMS-2200 support for comScore’s Theatre Command Center (TCC3) TMS, from Hollywood Software.